Editorial: Who opposes proportional representation, and why? There’s an old saying: follow the money. In the case of the upcoming referendum on whether or not BC should change our voting system from First-Past-the-Post (FPTP) to a form of Proportional Representation (ProRep), those most vocally opposed to a change seem to have one thing in common: they are people who think they would lose power under ProRep -- power to govern with less than a majority of votes, or power to heavily influence government. Both those losses of power add up to losses of financial advantage. With the BC Liberal Party, the reasons are clear: they fear that with ProRep they could no longer get a majority of seats in the Legislature with a minority of the votes. They strongly oppose ProRep for that reason. Then there is the lawsuit initiated by the Independent Contractors and Businesses Association (ICBA) to try to stop the referendum. ICBA seems to resent the government’s attempt to level the playing field when it comes to influencing public opinion on electoral reform, and characterizes the limits placed on spending and donations as “restrictions on public participation in the referendum process.” I see it instead as trying to impose a degree of integrity – to keep big money from controlling public opinion. The government has allowed two groups to receive funding and to advertise – the designated “pro” change group, and the designated “con” group. There are limits on the funding: each side is awarded $500,000, and is allowed to receive donations from “eligible individuals” up to a further $200,000, but no more than $1,200 per person – and nothing from corporate entities. An “eligible individual” is a resident of BC who is a Canadian citizen or a permanent resident. So when I see the ICBA complaining about “restrictions on political expression,” I see a big-money organization with a vested interest in maintaining the electoral status quo for its own benefit . . . whining about not being allowed to hugely out-spend and out-advertise mere citizens who just want a better system to represent their values in our government. The ICBA also charges that the referendum questions are not clear enough – that the ballot will be too confusing for us simple-minded voters. It complains that the voting systems are not described in detail on the ballot -- but really, how big a ballot would that take? Can't voters do their homework before voting? The court documents also complain that voters cannot express a preference for “none of the above” – but I think ICBA is wrong on that because actually, they can, simply by answering the first question and not the second question. Another complaint is that the government “has not indicated how the adoption of the new voting system will impact the electoral boundaries and districts under the new electoral systems, which will only be determined after the referendum.” But the government has indicated that, for each proposed system, in general terms. The Electoral Boundaries Commission in BC will still be governed by its legislation, and that requires it to hold public hearings on its report, as it has always done. The public will be entitled, as always, to make representations at those hearings. 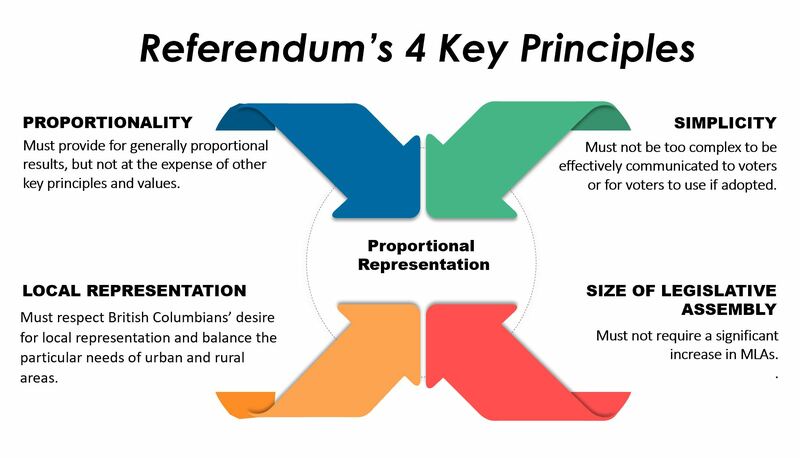 Since each of the ProRep systems being offered would affect the size and shape of electoral districts somewhat differently, it makes good sense that the government didn’t spend the additional money to get the Electoral Boundaries Commission to recommend the size and shape of all the electoral districts for each of the three ProRep systems on the ballot and create three separate reports, in advance of the referendum. I suggest that doing so would be a massive waste of taxpayer funds, Electoral Commission time and energy, and would provide no benefit. Another straw grasped at the by the ICBA in its lawsuit is the complaint that “voters will not be given an opportunity to approve the actual system . . . prior to its implementation for the next election.” Well, not twice, anyway. The voters will already have expressed our will. And not only that -- if we do choose a ProRep system, we will have the opportunity to experience it in two election cycles and then vote on whether to keep it, or return to FPTP. Our vote in the second referendum would be founded on actual experience, rather than on unsubstantiated beliefs, fears, advertising and hype. I think the opportunity to use a ProRep system, and then decide whether or not to keep it, is a very good reason to vote in favour of ProRep. Two cycles would allow citizens and legislators to experience how the system plays out, in real life, here in BC, for both urban and rural residents. Then, if we don’t like it, we can chuck it. Full disclosure: No one is paying me or favouring me in any other way to publish these opinions. I receive no financial advantage from expressing my support for ProRep. Who knows? -- I may even be suffering a business disadvantage.